SCVHistory.com LW2253a | Film-Arts | 'SCV In the Movies' on Location. July 7, 2012: Hosts E.J. 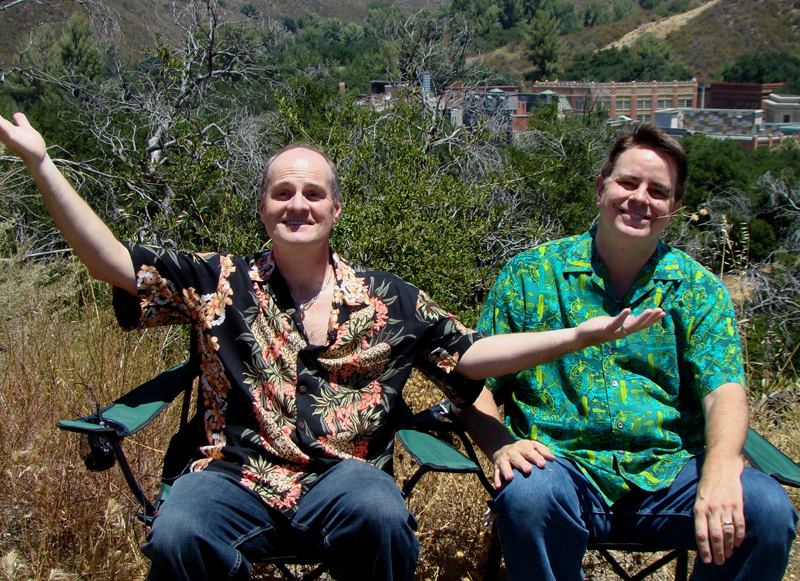 Stephens (left) and Bill West on the new set of "SCV In the Movies" in Placerita Canyon. Disney uses it, too. Just kidding. E.J. and Bill are sitting by the side of Placerita Canyon Road to shoot a wraparound for SCVTV's hosted movie show with The Walt Disney Co.'s Golden Oak Ranch town set in the background. Placerita Canyon appeared in feature films both before and after Disney bought the property. About "SCV In the Movies": The Santa Clarita Valley has always been Hollywood's back lot, doubling for everything from Vietnam to alien planets. Whether it's a chase scene in John Ford's "Stagecoach" or Steven Spielberg blowing us up in "War of the Worlds," it happened right here. SCVTV's original series, "SCV in the Movies," is just that: Movies with the SCV in them. "SCV In the Movies" is hosted and scripted by E.J. Stephens and Bill West. Stephens is a film historian, a published author of history books and has served on the Santa Clarita Valley Historical Society board of directors. West is a motion picture industry software engineer and a director of the Friends of William S. Hart Park and Museum. Check the schedule at SCVTV.com for showtimes or watch it now at SCVInTheMovies.com.